Despite being nominated for several golden globes and an academy award, In Bruges flew under viewersʼ radar, generating only about $33 million at the box office. I might have missed it myself, if not for a positive review in a magazine skimmed in a dentist’s waiting room. 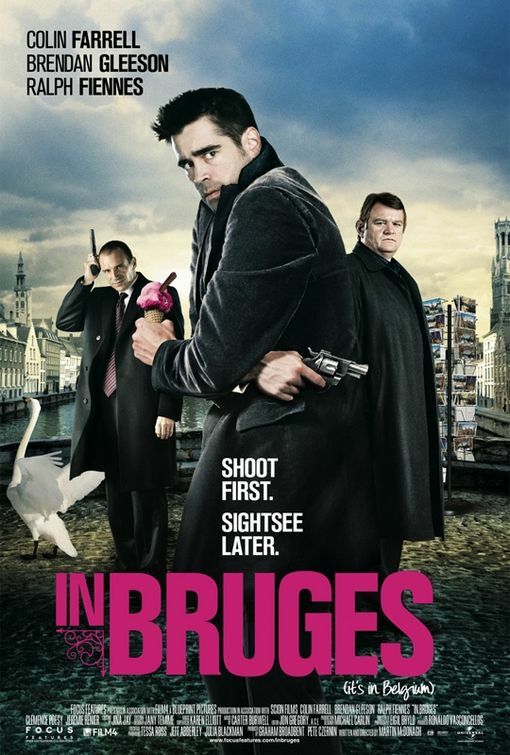 Directed by first-time Irish filmmaker Martin McDonagh In Bruges is a black comedy and a real hidden gem. Think of it as something of a European version of Pulp Fiction. The screenplay, also by McDonagh, was inspired by both Harold Pinter’s 2005 play The Dumb Waiter and the McDonaghʼs first trip to the city of Bruges, a canal city in northwest Brussels that has been called the “Venice of the North.” Bruges is known for its medieval architecture, which has survived to this day, and its world class beer! McDonagh says he was struck by the city’s beauty, but was nonetheless bored. So he wrote this film. The Plot - The plot revolves around two hit men in the employ of a British crime lord. 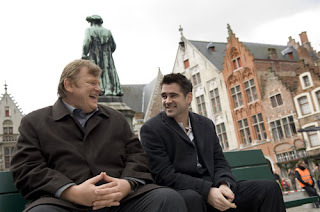 The film opens with Ken (Brendan Gleeson) and his rookie partner Ray (Colin Farrell) already in Bruges, having just completed a job which did not go smoothly. The two have been ordered by their boss Harry (Ralph Fiennes) to lay low while he cleans up the mess. For a hit man, Ken is highly cultured. He looks forward to spending his “vacation” checking out the historical and artistic aspects of the city. Ray, on the other hand, has no such interest. He views Bruges as a “sh**hole,” and is only interested in finding a bar and getting laid. Making matters worse, it’s Christmas and only one room with twin beds is available. Funny scenes abound and Ray delights in kiddingly ordering “a straight beer for me and a gay beer for my gay friend” at a local pub. Through their interaction, we gain insight into what went wrong on the last job. This was Ray’s first job. He did the actual shooting and is extremely depressed about the unintended consequences of what he’s done. That evening, Ray happens upon the set of a film being shot in the city. He meets Chloe (Clemence Poesy), a local drug dealer currently supplying the film crew, and Jimmy (Jordan Prentice), one of the actors who also happens to be a bigoted American dwarf (think about that for a second). At dinner the next night, Ray and Chloe are surprisingly open with each other about who they are and what they do, considering it is their first date. Their honesty appears to create a bond between them, laying groundwork for a potentially real and redemptive relationship considering Ray is starting to become suicidal. To absolutely no surprise, Harry is depicted as a brutal man with a peculiarly strict moral code, albeit one not altogether uncommon among gangsters. He loves his family (all children actually) and accepts zero tolerance for violence that spills outside the “business.” In Harry's view, anyone violating this code deserves to die, no exceptions, and should willingly kill himself as atonement. This view becomes critical to the story as Harry decides Ray must die for violating the code. What happens going forward will not be revealed here, however. The synopsis to this point merely tees up the core of the film, and having read it should hopefully not spoil your enjoyment of the movie. Themes - In Bruges delves into the murderous, profanity laced, drug infested world of organized crime. It deals with its subject matter in a darkly comedic manner much reminiscent of Pulp Fiction. While the dialog can at times be hilarious, the underlying theme actually aims a bit higher and is perhaps best summed up by a question: Is it possible for those who commit unspeakable acts of violence for a living to be sufficiently dynamic persons to also be capable of qualities such as love, loyalty, and responsibility? Can this be said of all the central characters? A secondary theme relates to the concept of perception as reality; one man’s heaven is another man’s hell. Wonderfully subtle dialog and imagery support this theme throughout. The Cast - While the plot is solid and writing excellent, it is the acting which lifts the film to loftier levels. Colin Farrell (Tigerland, Phone Booth) won the golden globe for best actor, beating out co-star Gleeson. (He won $20 from him in a friendly bet.) The character Ray is quite complex and Farrell plays him just right. While I usually enjoy Farrell anyway, this just may be the best work of his that I’ve seen. Brendan Gleeson (Braveheart, Harry Potter) as Ken, is every bit as good in an equally complex role. Ralph Fiennes (Schindlerʼs List, Harry Potter, English Patient) as Harry Waters does “menacing and evil” about as good as anybody around. I’ve never seen him mail in a performance and he certainly does not disappoint here. Clemence Poesy (Harry Potter), Jordan Prentice (Howard the Duck) and Thekla Reuten (The American), as the proprietress Marie, are all convincing in secondary roles. Other Factors - While acting is central to why In Bruges works so well the writing, cinematography, and plot development are all actually quite good as well, especially for a first time director. The score by Carter Burwell, who has done most Coen Brothersʼ scores, is also excellent. The plot takes a bit long to hit its stride, but even the distractions serve specific purpose. As it winds toward the climax, the action becomes truly riveting to watch. One key scene involving Ken and Harry in the bell tower is particularly well shot and scored. The scene utilizes to magical effect the song “On Raglan Road” by the Dubliners (one of the great love ballads of all time) as viewers realize what is occurring and why. As far as negatives, the language is truly atrocious, if not strictly speaking gratuitous, given the characters portrayed. Between language and violence, it is not a film most would feel particularly comfortable viewing with a mother or daughter. That apart, it remains a film I can unhesitatingly recommend. Jed, Thanks for another fine review! I have to say that you've made me want to see this film. The description as "the European version of Pulp Fiction" particularly caught my attention! Mike, I haven't seen it yet, but having read the review, I don't think it spoils anything. Jed definitely doesn't talk about the ending or how the plot moves. I thought this was going up at 4:00 for some reason, so sorry for the delayed response. Mike - You should be able to safely read this review without spoiling it for you, unless you want to know absolutely nothing about it. I say "moderate" because I do talk enough about the story to give the reader a good sense of what the film involves. I specifically revealed nothing critical. That said, depending on how the comments go, that could change. I only promise to make sure I label any spoilers. As I mentioned to Andrew, I think this is a close to great film of it's type. The main draw backs are language and violence. Some people really don't want that, so, sure, I wouldn't recommend to them. If you saw and liked Pulp Fiction, I say go for it--no problemo. Jed, I'm sorry, I put it up early so that I could get the link and insert it into the article for the main page. I wasn't sure I was going to be around at 4:00 to do that and you can't get the link until you publish the article. So it's my fault, not yours. Jed, P.S. Let me add, I have become a huge Colin Farrell fan, so I'm interested in this even from that point alone! I thought he was particularly excellent in Phone Booth, a movie that would have been just lousy if he didn't give such a great performance. Andrew - I first hear of Farrell while traveling in Ireland in the late 20th century. They said if you haven't heard of Colin yet, you will! They were right. What impresses me is that so far in his career, he has seemed to me to be a "disappear into the character" style actor. Of course, now that he has become an "A" list Hollywood guy, that will become harder, and he may end up gravitating towards playing himself. He has shown himself capable of a tremendous flexibility in the characters he portrays. Ray is a fantastic character. He is a thug, but a very vulnerable one; almost childlike in his behavior and a tremendous underlying humanity. Some of his comic lines are delivered deadpan which makes them work so well. In explaining his dislike of Bruges to Ken, he says "I grew up in Dublin. Maybe if I had grown up on a farm and been "bleeping"retarded, I would have liked this place, but I didn't." Still, the real character gem of the story, at least to me, is Ken. "Phone Booth" and I was super impressed. Since then, he's impressed me in everything he's done -- even when the movie stinks, like "Daredevil." Jed, Excellent review! I haven't seen this, but like Andrew said, I am intrigued. I like the cast and the concept sounds good. I'll check it out! Thanks! I'd say also check out a couple of his early films. Tigerland is about boot camp in Louisiana during 'Nam, and the Recruit. I also happened to really enjoy Crazy Heart where he had a clearly supporting role to Jeff Bridges, but that is a pretty neat look at the outlaw country music business. The point is, I suppose, all are very different characters and played quite differently. I didn't read past the spoiler warning because this sounds up my alley. Yup, never heard of it before. I'll check it out, though! Thanks! Ed - I think you will not be disappointed. This is such a good film, it literally demands multiple screenings to break it all down. There are so many seemingly innocent little lines of dialog or actions that come back to play a role later in the film. When I do these reviews, I watch the film again so it is fresh in my mind. Later, I might do some research to get information and tidbits that would not otherwise be known. For example, the actors visit a real museum in the town and view some actual masterpieces there. One is the "Flaying of the Corrupt Judge of Sisamnes" by Gerard David. That Judge, and his punishment were real (c. 5000 B.C. in Persia.) As Ray continues to be wracked with guilt himself, his uneasiness at viewing this painting is palpable. Likewise, they both view a famous triptych (3 paneled painting) by the Flemish Master Hieronymous Bosch called "The Last Judgement - Bruges." This portrays the city as heaven, hell, and purgatory and fits with one of the themes. Ray has a l.o.l. line where he says "purgatory? Isn't that where you weren't f'ing horrible, but you weren't really all that great either." Crispy - no real spoilers here. Good review, Jed. I remember hearing of this movie when it first came out, but wasn't interested in seeing it. Call me weird, but I was somehow turned off by the fact that it was set in Belgium. But I may have to give it a shot. I do remember being somewhat amused by a clip I saw where Farrell's character and another guy were shooting at each other inside a house and casually conversing all the time, and some woman who lived there was like, "You're both out of your minds!" Made me laugh. All I can say is if you liked Pulp Fiction . . . .
You are right, there are so many funny scenes. The one you describe involves Farrell, Fiennes, and Thekla Reuten. It is hilarious. One of the taglines for this film is "shoot first, sightsee later." Jed, That's interesting and I'll keep it in mind when I see the movie. I appreciate the effort everyone puts into these article, it's clear that these things aren't just thrown together. After my friends and I saw this, we couldn't stop quoting, "You know how much s--- I get from black midgets?!" It's not really my kind of movie but my friend and I saw the trailer in front of There Will Be Blood and we both thought it looked interesting. A little too bloody at times for me but still, a very interesting movie with great camerawork, great acting, and a great screenplay. I also love Ralph Fiennes' line to his wife, "You're an inanimate f---ing object!!!!" Scott - that is one of the classic lines, but it is like Pulp Fiction in that regard, there are so many. Did you realize that Jimmy's views are pretty much taken from Charles Manson and his theory of "Helter Skelter." Strange stuff. As I broke this film down, and when I consider how almost every action and piece of dialog has a purpose, I was amazed at how good this film is, particularly for a first time director/writer. McDonagh clearly put a lot of thought into this. What did you think of the score? There is all kind of different pieces in there from a Chopin to Townes Van Zandt to the Dubliners. Pretty amazing stuff. The other thing that struck me about this movie, is the characters are dynamic enough to care about. There is a very worthwhile set of bonus features on the DVD where the director and major actors discuss the film and their characters. Brendan Gleeson got it right I think, when he pointed out how these three guys are in some respects very normal people who just happen to be in the murder for hire trade. Chloe is the same way. She is a thief and a drug dealer, and yet, she is quite a likable young person. That may not be realistic, but it is extremely engaging. Jed, Lawhawk sends his apologies -- his internet connection was tragically murdered and he's being questioned by the tech police right now. Tennessee: I'm b-a-a-a-c-k. What a fiasco, and I was starting to go into internet deficiency panic. It all started with a techie friend getting me a wireless router for my birthday so my grandkids can get on the internet in the two bedrooms. I neglected to tell him (well, actually, I forgot) that the CD-DVD RW drive hasn't worked in over a year, so his install and instruction disk was useless. He tried to work around it, but couldn't, and then my one ISP connection crashed. Oi! Great review. I have several friends who reluctantly went to see the movie or rented it on NetFlix because there wasn't anything else new that day, and they all came away amazed at how much they enjoyed the movie. But until I read your review, I wasn't quite sure why. At least my TV and DVD players aren't connected to my computer(s), so I'll be able to enjoy the film on your recommendation. Hawk - how did we live before the internet? Quite well, actually. I was watching "The Closer" the other night and they were doing a great riff on trying to get phone help from your tech provider (yelling REPRESENTATIVE into the phone, etc.) It can be frustrating and I bet everyone can relate. I was taken aback a little tonight in that only one person had seen it. I suppose I shouldn't be since, as I pointed out, it did pretty much fly under everybody's radar. Try as I may, I really can't come up with a serious weakness, other than that the nature of the genre is going to somewhat limit the audience. Still, as I was mentioning to Ed, I tend to look for films that are a little less known. So hopefully, I have encouraged a few people to see this one, and I think they will be pleased they did. I am finding the downside to all of this is that it is fun to talk about and dissect movies you enjoyed. That can only happen if people have actually seen them. It is sort of a double edged sword. Andrew - I sent you an e-mail. I only saw the movie once a couple years ago so I honestly don't recall the music and I don't think I've seen The Godfather enough times to have noticed those similarities. But it's definitely interesting. Colin Farrell is one of those guys who just sort of appeared and was instantly good. I thought he did a great job in Minority Report (along with his character's habit of kissing his cross necklace - a nice touch). The media likes to brand someone "The Next Big Thing" and for some people, I imagine it's a title that's hard to live up to (assuming they think they have to) but Farrell seems to have marched to the beat of his own drum. Scott - Like a lot of soundtracks, Burwell's own composition is mainly a single melody or even just a motive serving as a main theme which he switches around from major to minor keys depending on what is happening on screen. Some other interesting tidbits: The film within a film is mentioned by Chloe as being less than a homage, but rather a "nod of the head" to the early '70's film "Don't Look Now." The only similarity is that film was shot in Venice, also a canal town. For some heavy duty symbolism, on the last night when it all goes down, Jimmy and the crew are shooting this dream sequence where most of the little people actors are dressed in costumes taken from the Bosch painting "The Final Judgement." That is one of those little inside joke touches that make it fascinating to me. LawHawk, my sympathies on the Internet issue. Starting around Memorial Day weekend and for about two weeks thereafter, my computer was continually crashing and I had to use my sister's for my "Fringe" TV review. By the way, if anyone has really serious problems develop with their computer and has AT&T as a service provider, I suggest you just take it in somewhere rather than depend on them to fix it. They are next to useless for that, even when English is their first language. T-Rav and Tennessee: I'm on satellite. We won't see cable or DSL here for another ten years, if at all. My ISP stinks, but the problems are more with the computers. I had AT&T DSL in San Francisco. It worked beautifully, when it worked at all. My favorite thing was the AT&T Self Support Tool. It didn't work. It took forever. And sometimes it would just tell me it couldn't connect to the tool. Every problem here is exaggerated because download speeds are so slow you're not sure whether it's the computer or the ISP. It's better than dialup, but not by much. Well, generally people see the review then they opt for the movie or a book, but after seeing the movie i must say i am very impressed with this review and in fact everything the author said in this article is true to its word!! I actually saw this one but I can't recall why I chose to see it. Like T-Rav, I'm a Flemophobe. Okay, not really (entirely), but I thought this flick might be a typical "it's great because it was shot in Europe and they loved it at Cannes" movie, which usually means I won't like it. But I do like Farrel in Phone Booth so maybe that's why I watched it. Whatever the reason why, I'm glad I did. I say this even though a few times I almost turned it off because of the gratuitous language, which, of itself don't bother me but, again, I thought it was some new director trying to be "relevant" with over-the-top cussin'. Fortunately, I stuck with it and was happy to see this film wasn't the standard canned Cannes fare. I like it better than Pulp Fiction. Probably because I cared about the two main characters more. Perhaps that is due to Farrell's vulnerability and obvious remorse, and Gleeson struck me as a likable father figure despite being a hit man. Pulp Fiction was still a great movie but, like most Tarantino films I never can muster up hardly any empathy for his characters. At any rate, In Bruges will not disappoint even if one happens to be a Flemophobe who is terrified of little people. Thanks, Ben! I never used to be bothered by language, but like you, if it's just thrown in for the rating or completely over the top, it becomes a tad irritating. That said, given that these are Irish and English gangsters, I can't honestly say it is any more gratuitous than that in "The Departed" or "The Fighter." You expect these characters to speak that way. Plus, the lines are so funny, it is hard to be offended when you are laughing your head off. As far as the European flavor, it may at first appear that they are tapping into anti-American feelings that have been force fed to Europeans for years. Certainly, the character Ray seems to have a dislike, but after a while, I realized it was all a running gag culminating in his beating up the snotty Canadian couple because he thought they were Americans ("Oh, Yeah . . . what about the Vietnamese, then?") Or Jimmy constantly admitting he is an American, while asking not to have it held against him. Pretty funny stuff, actually.